In 1849, when the two Sikh Wars had ended in the annexation of the Punjab, 6 regiments of infantry and 5 of cavalry were raised as the Transfrontier Brigade, by 1851 it was called the Punjab Irregular Force (known as Piffers). The first 5 of the infantry units were recruited from disbanded Sikh troops and the 6th by the conversion of the Scinde Camel Corps. The 3rd Punjab Infantry Regiment was disbanded in 1882 and its number left blank, and in 1903 the 1st, 2nd, 4th, 5th and 6th Regiments became the 55th, 56th, 57th, 58th and 59th Rifles. 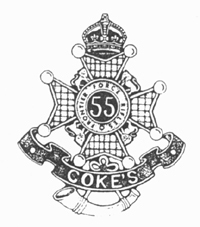 55th Coke's Rifles started life in Delhi in May 1849 and was the 1st Regiment of Punjab Infantry. Whereas the other Punjab regiments wore drab uniforms with varying facing colours, the 1st chose to wear very dark green with red facings. In 1903, they were afforded the status of Rifles and were named after a former commander with the title of 55th Coke's Rifles (Frontier Force) universally known as 'Cokies'. Their service in WW1 was to remain on the Frontier, stationed at Bannu with detachments at Idak, Saidgi, Thal, Jani Khel and Kurram Garhi. The regiment comprised 2 companies of Sikhs, 2 of Afridi Pathans, one of Yusufzai Pathans and one of Punjabi Musalmans. Half their strengh went to France as reinforcements. Among these was Jemadar Mir Dast who won the VC while attached to the 58th Vaughan's Rifles. He had a brother in the 58th called Mir Mast who managed to win the Iron Cross, Germany's highest award, after deserting with a small party of Pathans. When the 13th Frontier Force Rifles was formed in 1922, the 55th, 56th, 57th, 58th and 59th Rifles returned to their old numbers as the 1st, 2nd, 4th, 5th and 6th battalions, the 3rd remaining blank as before. The 13th adopted the uniform of the old 55th, dark green with red facings, and were stationed at Abbottabad. The 1st battalion was captured by the Japanese in Malaya in February 1942 and reconstituted in April 1946 as 14/13th.